Our old-fashioned handcrafted natural soaps are created in small batches using a variety of natural oils, butters & extracts. 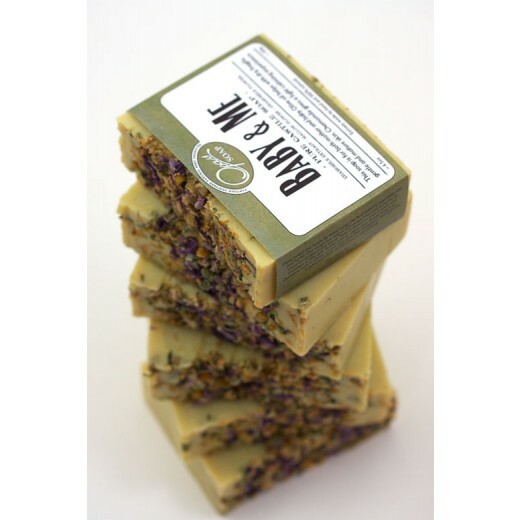 This luxurious soap consists of Pure Cold Pressed Kosher and GMO-Free Olive Oil and extracts of mallow and chamomile. Olive oil is a natural humectant helping to attract moisture to the skin for prevention of further dry or chapped skin. Olive oil is a very gentle oil making it excellent for sensitive and baby skin. 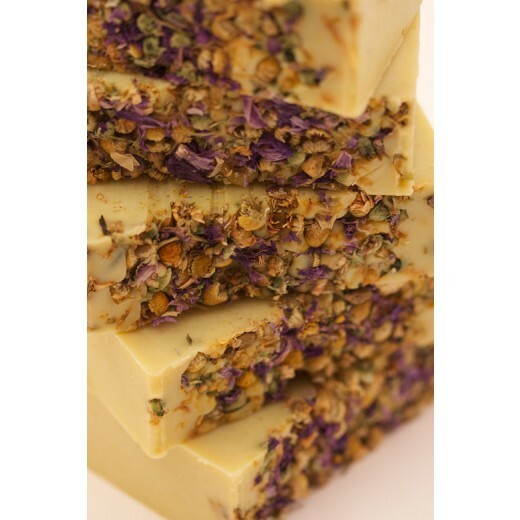 Chamomile is calming but is not expressed in a overwhelming manner in this soap. Our baby and me soap can be used for those who like little to no scents in their soaps. We carefully choose all of our ingredients for their many benefits. Enjoy a super moisturizing, cleansing, and soothing bar of Baby & Me Castile Soap for you and your little ones. This soap has a creamy yet velvet feel to it as it conditions your skin. Switching to soap made with 100% Olive Oil can truly benefit your skin's health including; eliminating itchy, dry, and flaky skin. Mother, child, and or baby can have one gentle soap together that will help deeply moisturize and nourish the skin. All of our soaps are pH balanced and cured for minimum of 1-2 months. Tips: Baby Soap should be slightly acidic. Baby skin is 5 times thiner than our adult skin and needs a pH balanced soap to avoid irritation. Used it on my 3 month old with eczema prone skin for the first time!! It left his skin so soft..will never use any other soap for my delicate babies again!! Will be a repeat customer. I really liked this soap for myself and for my son, though I really used it for me. It was gentle on the skin and didn't leave a film behind like some bar soaps do. I bought this for my new grandson. It smells incredible...very light and fresh. So moisturizing but not oily. GREAT!! Smells great! I got it as a gift and will have to order more for me! LOVE this soap! Use it on my daughter at bath time and she feels so soft and smells wonderful!